Because of Afghanistan’s geographical position—on the edge of central Asia with India and China beyond to the east, and Iran, the Middle East and the numerous cultures of the Mediterranean and the rest of Europe to the west—it was criss-crossed by ancient trade routes. In many ways, then as now, it was a hub and meeting place for diverse cultures and neighbors, both near and distant, over thousands of years. In the modern world it’s all too easy to think of Afghanistan solely as a place of conflict—but taking the long view we can see in the rich materials and ornate craftsmanship of these objects a far broader story. Afghanistan has always been a part of a complex network of cultures that doesn’t always take account of contemporary political boundaries. Long-distance travel and globalization may seem like relatively new inventions, but the ancient world was much more connected than many of us may think. 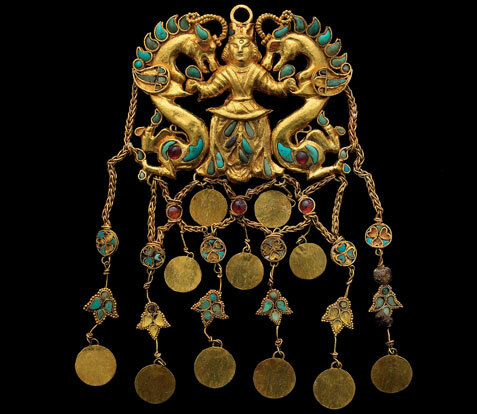 One of the pieces on loan from the National Museum in Kabul illustrates this point particularly well: a pendant from the Tillya Tepe hoard found in the north-west of the country (above). It features inlays of gold and turquoise. Two dragon-like beasts in the design suggest to some the influence of Chinese art but to others, represent the heavenly horses of the Ferghana valley of neighboring Central Asia. It also includes lapis lazuli, a type of blue stone only found in Afghanistan but coveted in the wider world for thousands of years. It crops up in the jewelry of ancient Egypt, the art of the ancient near east and as far afield as the art of the Italian Renaissance. The fact we nearly lost many of these stunning objects and signposts to the past to the events of Afghanistan’s recent history underlines how precious they are as well as the fragility of cultural heritage. Cite this page as: The British Museum, "Crossroads of the ancient world," in Smarthistory, February 28, 2017, accessed April 19, 2019, https://smarthistory.org/crossroads-of-the-ancient-world/.